In case you haven't noticed, I'm a little bit obsessed with fall. I've got all the leaves, lights, pumpkins and candles a girl could ever wish for. If it were up to me, I'd spend every weekend in a corn field with a cup of hot chocolate wearing my jean jacket (which is currently missing, so prayers are appreciated). Personally, I think this stems from being deprived of seasons until I moved to Virginia when I was 18. Today, I was in WalMart grocery shopping (as is every great cook on a Sunday afternoon) and I couldn't help but notice all the cartons of apple cider. And then I realized that it couldn't be that hard. And you know what? It's not. This is better than 1,000 fall candles. The aroma that will fill your house is unbelievable, and it's the perfect fall treat. Cut the apples up, leaving the stems, leaves, etc. We'll take care of those later. Toss them in a large pot. Cut up the orange and toss it in the with apples. Add the brown sugar, cinnamon sugar mixture, cinnamon stick halves, nutmeg, cloves and cinnamon. Have the water come about an inch above everything in the pot. Once it starts boiling, some of the water will evaporate. Mix well. Bring to a boil and leave for about an hour and a half. Check on it occasionally, and I'd stir it every thirty minutes. Lower heat and simmer for 2-3 hours. Remove from heat. Using a potato masher, mash everything in the pot. Simmer for awhile longer to make cider darker and sweeter. Using a strainer, drain the liquid into another large pot. I had to strain mine about 3 times to get all the little pieces out of it. Do it as many or as few times as necessary to get a smooth cider. Discard all the "guts" in the strainer. Serve with a cinnamon stick as a stirring utensil. Did I mention how great this stuff smells? If you're not interested in cider, at least make this so your home smells perfectly fall-y and festive. 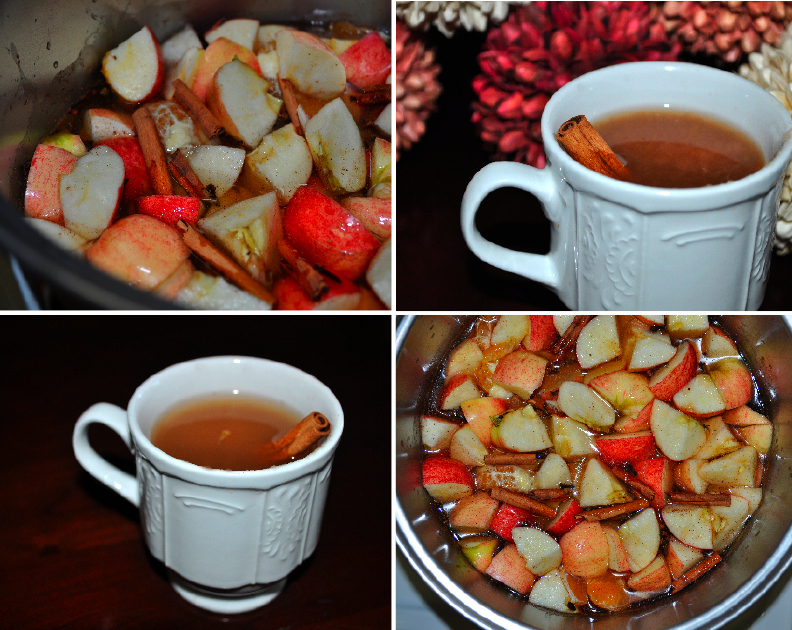 Tim's not interested in apple cider, so I set aside half of this to boil at a later date so my home smells good again. We do what we can.